A shorter introduction to the ACME EDM experiment can be found here. In the first introductory post of this series I outlined the immense precision of the ACME experiment in measuring the electron’s “shape.” A natural followup question is, how did we do that? In this post I will outline the basic measurement scheme in our experiment in the most general way possible, avoiding most of the technical physics jargon. The next post after this will get into the more gory technical details, but this one should hopefully be an understandable, but still mostly accurate and insightful explanation on how we do what we do. I will refer to the incarnation of the experimental apparatus which was used in the 2014 measurement as ACME I, whereas the current incarnation (with various improvements) is called ACME II. I will explain mostly the features of the ACME I experiment, although at this level the two generations are not very different. is typically measured in units of , and electric fields are in units of , so has units electron volts (eV), which is an energy unit,2 so this makes sense. In other words, to look for this asymmetry, we want to put an electron in an electric field and observe its behavior: we want to see if there’s an energy shift which would come from this asymmetry, as expressed in the quantity . Notice that if we increase the strength of the electric field , then the overall energy shift also gets bigger and easier to find. This is literally what we do in our experiment: we are taking electrons and putting them in an electric field. Crudely speaking, we prepare our electrons using lasers and other contraptions, launch them through the field, and then interrogate them after they’ve passed through the field, observing how much they’ve “changed” as a result of this field. We can then narrow down to see whether they’ve changed more than we expected them to. If that’s the case, then that would be evidence that and thus the electron is asymmetric. In a nutshell, that is what we do in the ACME EDM experiment. However, it turns out that it’s not that easy to physically realize in the real world. The part is easy: we can produce a relatively uniform electric field by putting two flat parallel plates a set distance from each other. 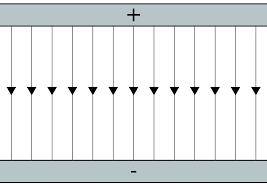 Two flat plats at opposite voltages, creating a uniform electric field between them – this is literally how we produce our electric field in the lab. It is the same as the common problems you encounter in high-school level electromagnetism physics problems. A cartoon of thorium monoxide (ThO), a two-atom molecule with an electron orbiting around it that we can use to measure the deformation of the electron in general. (The green lines with arrows depict the powerful internal electric field that that the electron experiences when ThO is subjected to an external electric field in our lab.) By some theoretical calculations by theoretical atomic physicists, we are able to deduce from our observations of , the electric dipole moment of our molecule (in this case thorium monoxide, or ThO). Thus by using ThO, we only generate an electric field of a few tens of V/cm for our experiment, yet the effective field experienced by the electron in the molecule is a billion times stronger. That’s a very large gain for our precision. Indeed, historically speaking, finding good molecules that have a large has been a critical first step in designing an experiment finding the electron EDM. There are other equally important reasons why we chose ThO as opposed to other molecules (which I shall get into eventually), but this large effective field is one of the most basic and important criteria. So we start our experiment by producing our thorium monoxide (ThO) molecules. This is done inside a vacuum-sealed box or cell, where a solid target of ThO2 sits inside. A high-powered laser (an Nd:YAG laser outputting about 10 watts of 1064 nm light) blasts the target in short pulses, almost magically creating molecules of just ThO (with one oxygen), a process called ablation. The cell has a small hole through which the molecules spray out as a beam into the rest of the experiment. Schematic of the ACME I apparatus. On the left we see the cell used to produce the beam of ThO molecules, in the middle we see the processes used to cool the molecules to the correct rotational state, which allows more of them to be prepared for the measurement, which occurs in the interaction region at the right side. Besides ThO, we also put in neon gas inside the cell, and the whole cell is cooled to a very low, cryogenic temperature of 16 K (-257 degrees Celcius). This neon gas is a buffer gas – it helps to cool down the ThO molecules in the cell, lowering the speed of the molecules as they come out of the cell. The result is a relatively well-controlled beam of molecules with an average velocity of about 185 m/s (666 km/h). This is “slow” by atomic physics standards, although it takes the molecules only several tenths of a second to traverse through the entire experiment! These molecules progress from the hole through the stem, which is what we call the airtight cylindrical pipe that provides a path for the molecules through the rest of the experiment. However, one thing to remember is that like light coming out from a hole, the molecules are diffracted outwards – they “fan out” with a non-zero solid angle. The further away the beam travels, the molecules are further away from each other. This is not ideal, as many of them start crashing into the walls of the stem, rendering them useless. In fact, in the first generation of the experiment only about 1 in 20,000 molecules ultimately reach the interaction region where the actual measurement itself is performed. As our sensitivity is proportional to the square root of the number of molecules, this directly affects the precision of our experiment. The more molecules you have, the more times you can repeat the measurement, and the more precise the result is. After the cell, the molecules go through the rotational cooling stage which I will explain in more detail in a future post. Essentially, to make it possible to use the molecules for a measurement, we have to get them to a specific quantum state. This is done by using laser light of specific colors,4 but the process is limited by some natural restrictions that make it less efficient. Rotational cooling manipulates the atoms using lasers to make it possible to later transfer more of them into the state we want. The actual transfer into the desired state for the measurement is done in the state preparation stage, where a different technique5 is performed to get as many molecules as possible from the ground state (the natural, default state of the molecules which we call the state), into something we call the H excited state of ThO, which is the quantum state the molecules need to be in to perform the measurement.6 State preparation is also important in that it immediately transforms an incoherent jumble of molecules in various different states into a smaller but more uniform population that we can examine as a unified body. The molecules are now ready to be put into the interaction region, where the measurement happens. There, we apply an electric field to them using a pair of parallel flat metal plates which are held at a distance of several cm from each other (see the first figure in this post). If is really non-zero, then here it will do its work and leave its mark.7 What happens to the molecule as it goes through this region is something called a spin precession. You can imagine this as similar to the precession of a top, only instead of a top, there is a similar vector quantity in the molecule called spin that precesses (rotates in orientation) as you keep applying an electric field to it. 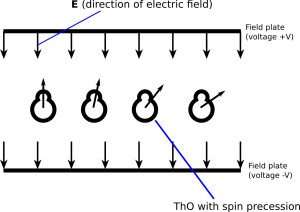 A cartoon diagram of what roughly happens in the interaction region, where a pair of field plates apply an electric field that causes spin precession as the ThO molecules go through it. are ready to be interrogated, again using a different set of lasers – the probe lasers. The probe lasers stimulate the molecules to get into a different, higher excited state – we call it the state.8 This state is naturally more unstable, such that after a very brief period the molecules decay back into the ground state. As they do this, they release energy in the form of green, 512 nm light as they do so. This is the light we detect using photo-multiplier tubes (PMTs), which are essentially black-and-white cameras. The input from the PMTs are sent to a computer as data to be processed and analyzed. Having finished their use, the molecules continue their journey out of the interaction into the “beyond” – they eventually crash against the other end of the stem, never to be seen from again. The entire above journey of a molecule takes only about 3-5 thousandths of a second. Every time the ablation laser fires into the target, as many as 100 billion molecules are produced, but only about 100,000 (in ACME I) survive the journey to the interaction region. Many are lost by crashing into the walls of the stem, while others are simply not in the right quantum state for the measurement. Even in the case of those which successfully undergo spin precession and get interrogated by the probe beam, only 1% of the photons produced are detected due to ineffiencies in our detection scheme – resulting in only 1,000 photons detected per pulse of molecules.9 The ablation laser fires every 50 ms, or 20 times a second. Typically, we take and average data for about a week before we reach a precision good enough for a “result”. Technically, at this point one would be able to figure out if indeed is zero or not – thus potentially making a discovery! However, this is not the end of the story. It turns out that there are various stray effects in our experiment that can happen, causing additional spin precession that masquerades as a non-zero value of . These are called systematic errors. The bulk of our time is actually spent testing and looking for these errors. We change various settings in our experiment, especially settings which we think shouldn’t have an impact on the measured value of . For example, we can turn on additional magnetic fields, change the intensities of our lasers, or do even seemingly trivial changes such as moving our lasers to the opposite side of the room and shining them at the molecules from the other side. In many cases, we would not expect a change in the measured EDM value, yet sometimes we do. If that happens then we have to find out why that setting is causing the change, and possibly remedy the condition before releasing our result. Thus is the entire process by which we perform a measurement of the electron’s shape, or , as physicists call it. It is a complex, multi-stage process involving multiple lasers, computers, and various equipment to control pressures, temperatures, and voltages in the experiment. Three different experimental groups collaborate and are roughly responsible for different stages of the experiment. The ACME experiment is unique in that it’s an experiment small enough to be fitted in a single room, but is still many times more complex (and expensive) than the average atomic physics tabletop experiment. To become truly familiar with all aspects of the experiment, a graduate student would have to gain practical skills in building lasers, aligning optics, maintaining vacuum systems, assembling electronics, program computers, and configure data acquisition hardware and software, among other things. This is apart from the physics one has to know to truly understand the experiment: standard techniques in atomic physics with some additional complexities due to the fact that we have molecules, not atoms, plus a sprinkling of particle physics to be able to truly understand the theoretical context of the experiment. For me, this is what makes the ACME experiment so exciting: we are building an extremely complex machine to measure just one quantity, but one which is so important that it can potentially unlock so many secrets about the nature of the universe! For more details on how exactly the shape of the electron is important and can do this, stay tuned!